Back Bay Books, 9780316392259, 336pp. This is a story of the 1970s. Of a road trip in a wood-paneled station wagon, with the kids in the way-back, singing along to the Steve Miller Band. Of brothers waking up early on Saturday mornings for five consecutive hours of cartoons. Of growing up in a magical era populated by Bic pens, Mr. Clean and Scrubbing Bubbles, lightsabers and those oh-so-coveted Schwinn Sting-Ray bikes. And of a father--one of 3M's greatest and last eight-track salesmen--traveling across the country on the brand-new Boeing 747, providing for his family but wanting nothing more than to get home. Steve Rushin is a writer for Sports Illustrated and the 2006 National Sportswriter of the Year. He is the author of four nonfiction books and a novel. His work has been collected in The Best American Sports Writing, The Best American Travel Writing, and The Best American Magazine Writing anthologies. He lives in Connecticut. 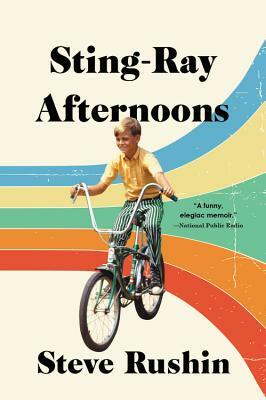 A "touching nostalgic memoir.... A vivid and comedic approach to [Rushin's] personal touchstones for the era. "—CBC Radio's "Day Six"
"He has an amazing way with words... Reading it made me nostalgic for a special time in my life. "—Eddie Gossage, President of Texas Motor Speedway on Dallas News' "Read Any Good Books Lately?"